This is another request in the open requests for food here on the site. I really like the way this one turned out particularly. I don't promise to get to them all, but I will do as many as I can. 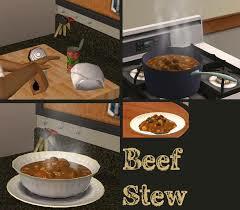 Here is beef stew, available for all three meals. Enjoy! This is a great dish, but the download link is broken. Hopefully it will be fixed so I can download this beautiful dish. Thanks in advance!!!! @ Anonymous, the link has now been fixed, thank you.